Update 1/27/14: I went and had a look for a reader here who bought the car for close to asking price. Some aspects were better than expected, some worse – but a decent buy on balance. 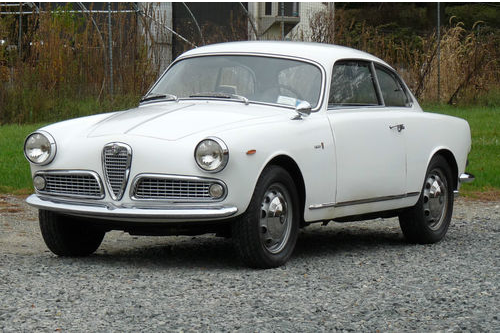 Giulia Sprint 10112 AR358494. 00112*12332 Body 6531139. There was a time when I would be all over a project like this Sprint 1600 on eBay, but nowadays I’m nose down focused on doing adult stuff like growing a business so I can buy a house for Rufus to grow up in. I know what you’re thinking – 5 posts ago I was patting myself on the back for buying a Spider not unlike this in its requirement for commitment and effort – fair enough – but I have been rationalizing that purchase with the notion I might sell the Porsche or AH3000 to preserve space, funds and sanity. I am sitting a few minutes from the seller of this car, so if anyone wants me to check it out for them – I wouldn’t mind the excuse to go see it for myself. Looks a bit like mine – even more like Aaron’s. No deal breaker issues from this angle. There was a time when old Sprints like this could regularly be found on the streets of Berkeley, San Francisco and other Bay Area cities. Lots of them sold new here. 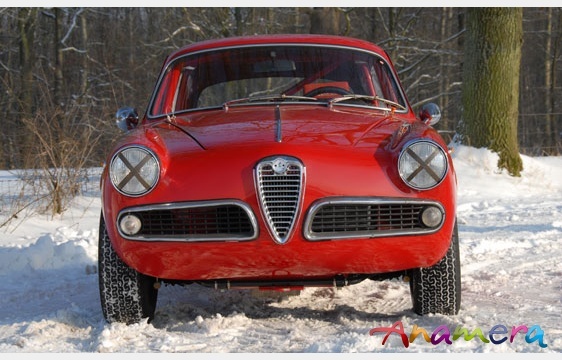 Giulia Sprint 1600 10112*355955, 00112*16110. 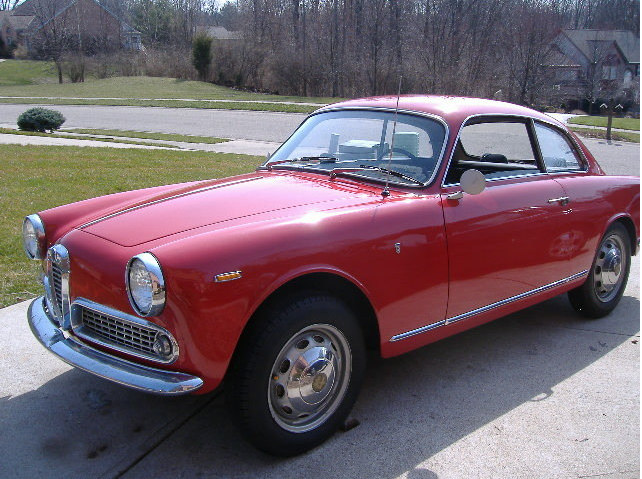 This car is on eBay right now out of Cincinnati from a seller who appears to have some experience with Alfa’s. 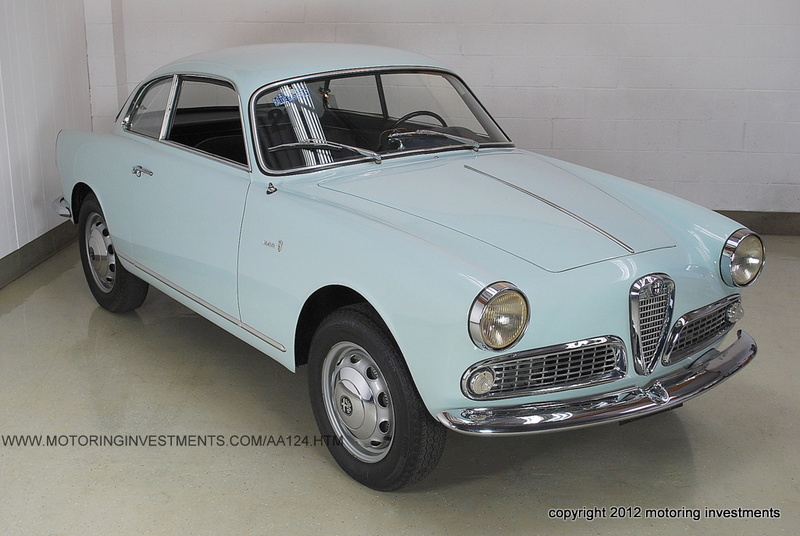 The car is a good, probably not too expensive starting point to Giulietta/Giulia Sprint ownership, as it runs and drives, looks ‘good enough’ and has only brake maintenance and tires as immediate known needs. It has some rust in the battery area and front edges of the rockers as well as signs of bubbling usually associated with poor paint prep, but nothing too bad. If anyone gets a sensible vin number let me know. Update 4/17/13: 1 bid, $25,000, sold. I suspect this will turn out to be a well bought car. Update 2/2/13: No sale at $24,101.69. I am thinking they would probably like to get at least $30K. 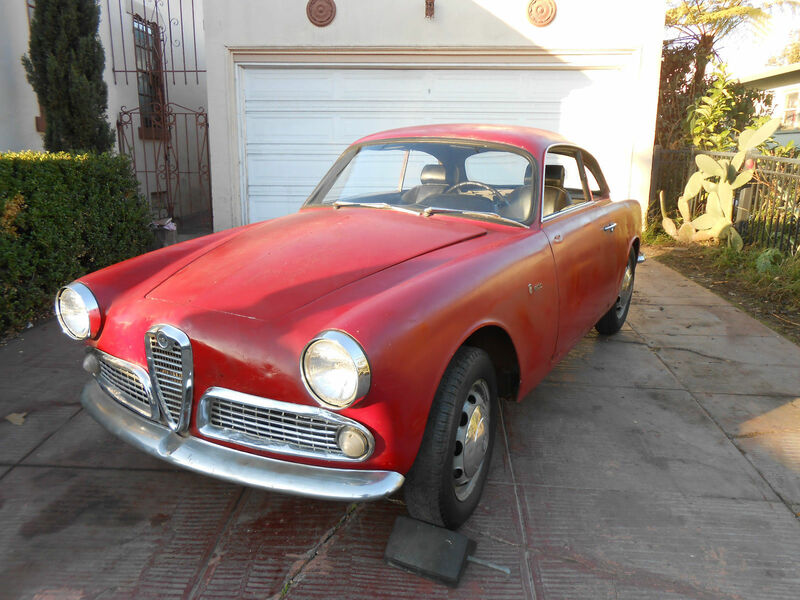 Giulia Sprint 10112 353030. This late Sprint is on eBay out of Mass. It looks pretty good in the pictures -well except for some mismatched looking paint on the lower edge of the doors, but I’ve talked to a previous owner and they assured me this was a sold car. I usually say it, but here it is again -I like these late Giulia Sprints -there’s a something neat about the fact that this is an 11 year old design when it was made, and only probably continuing to be made to use up parts. Has all the good points I usually mention -shut lines, straight trim etc. See what I mean about the paint on the lower door edge and on the rocker? I am assured that it was totally solid and just had some paint lifting, probably due to poor prep. Update 4/27/12: Seller sent me an email informing me that this car has sold for full asking price. Update 4/12/12: This car is available again for the new asking price of $49,700, quite a bit more than it was when it first entered the market. Detailing is thorough and some small problem areas have been fixed. There have been some stellar examples of these late 1600 Sprints on the site over the years (see here for one) that have failed to sell for much, but maybe it’s a case of ‘that was then’ -after all the highest priced SS from the same time was a little over $60K. Bravo for a an extremely well put together presentation. Update 12/17/11: Seller has been swamped with interest so the price is being rethought. Giulia 1600 Sprint 10112 356435. Kip informed me this car is available now from Motoring Investments in San Diego. Color combo is great and the car appears to be in fantastic condition. If it’s as good as it looks, it’s a bargain at $XXXXX and wont last. You don’t see these 1600 Sprints very often. I love these in Celeste blue. Body looks fantastic. Trim looks as good as the body and everything else looks as good as the trim. If I had money to spend on a car I’d be on the phone right now (paying off my VW Jetta Wagon ;^)). 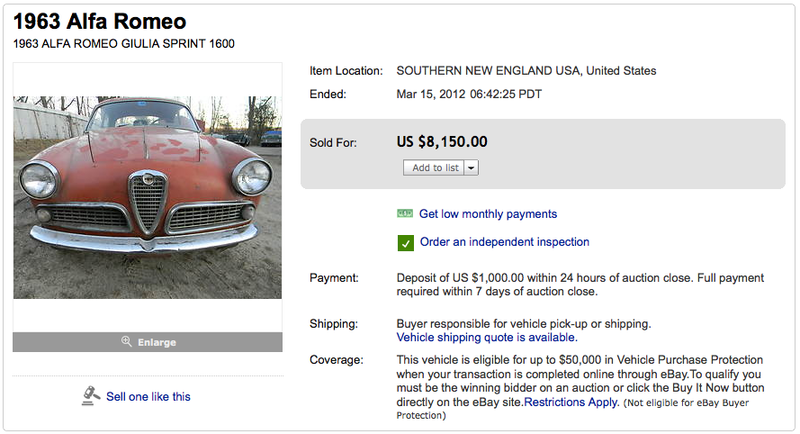 Update 4/6/12: Sold for $8150. Not sure if that’s good, but I guess so. Tons of work to do. Anyone here buy it? Giulia 1600 Sprint 10112*356053. This last of the breed Sprint is on eBay now out of New England. Looks like a decent car that was pulled from harms way just in the nick of time back in the late 60’s. It has rust – the kind that finds little areas of unprotected metal and works outward – rather than the west coast sort that focuses on areas with standing water or where water is trapped between carpet and metal. It does require some welding, but I think if stripped, it would be a puzzling collection of rusty patches, and not nearly so bad as your typical 1600 Spider barn find of the same era. You are tempted to say it looks like a reasonable car, and it is. But someone has gone through the trouble of getting house paint matched to the existing orangey red and painted over the bare metal. Maybe it’s special rust inhibiting stuff, but I doubt it. Doesn’t look half bad in any case. Giulia Sprint 1600 10112. This car is available now out of Italy for 25,000 Euro’s. It sports some odd treatments but looks to be a really nice car -I especially like the color combo. 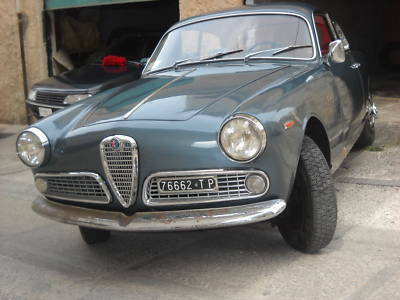 Giulietta/Giulia Sprint 385086. 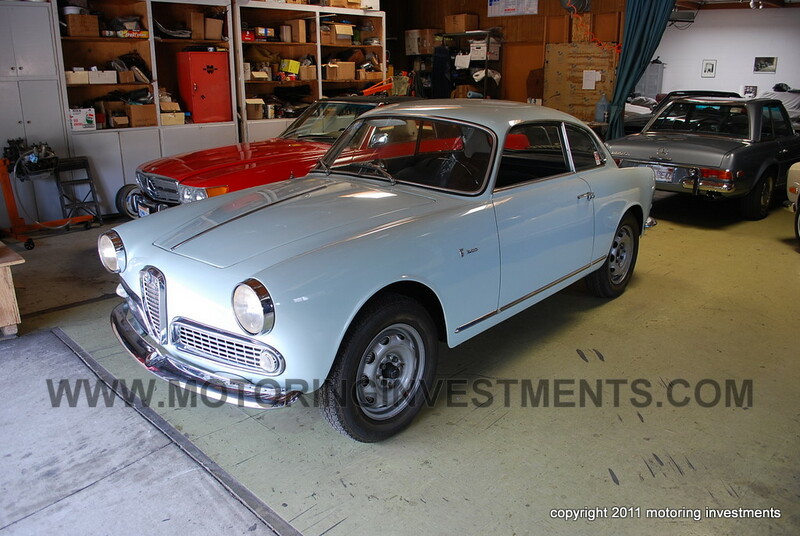 This car that I found on Anamera is going to be auctioned May 1st 2010 in Monaco by RM auctions (listed between a Frua AC 428 and a Aston DB2 Vantage!). 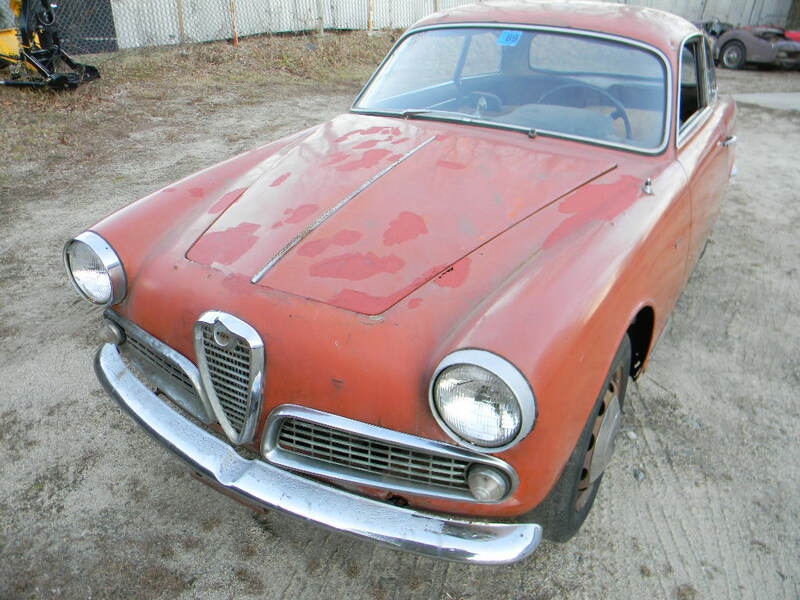 Car wears a 10112 Sprint 1600 build plate on the firewall but the vin number itself is that of a 10103 1300 Giulietta Sprint from 1965. I am guessing the vin is 10112*358086. I’ll send an email off into the cloud and see if they can clarify this. Car is set up for fast street or track use being stripped of bumpers and other unnecessaries and having a roll bar and race style controls. Car looks very good in this view with bumper missing and mount holes filled. Alfa grill badge is missing, no doubt to save a few grams. I like the blacked out mesh of the grills. Rear view mirror is in an unoriginal place. I like the cartoon dead fish eye X’s. A close look at the front reveals a thick sway bar.